For some odd reason every time I make these Oatmeal Chocolate Caramel Carmelita's they're gone before I can even snap a photo. This week our small group put out an APB for dessert since the family who was bringing dessert came down with the flu. How could I possibly not offer my dessert making skills? So Tuesday morning I scavenged the cupboards to find some kind of sweet treat to make. I haven't made Carmelita's since last winter and thought it was long over due for some Oatmeal Chocolate Caramel goodness. Plus I was hopeful for a picture which almost didn't happen because Colt had a late night sweet tooth and ate about a third of a pan of Oatmeal Carmelita's with or without my help late Tuesday night. I was relieved to find 2 bars left unharmed, whew that was close! Please beware Oatmeal Chocolate Caramel Carmelita's disappear fast! For Caramel Filling: In a small saucepan heat heavy cream, butter and sea salt over medium heat until butter melts. In a large saucepan add sugar, corn syrup and water. Heat sugar over medium-high heat until caramel starts to brown. DO NOT STIR caramel, if needed swirl pan. 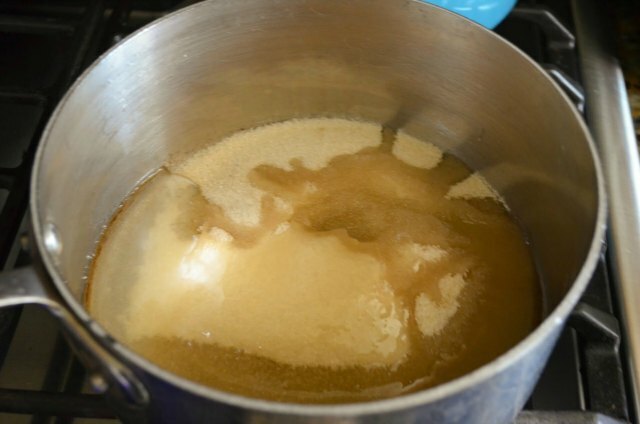 Once caramel becomes a medium brown color slowly stir in heated cream mixture. Cook an additional 3 minutes while stirring and remove from heat. Add vanilla and stir well. 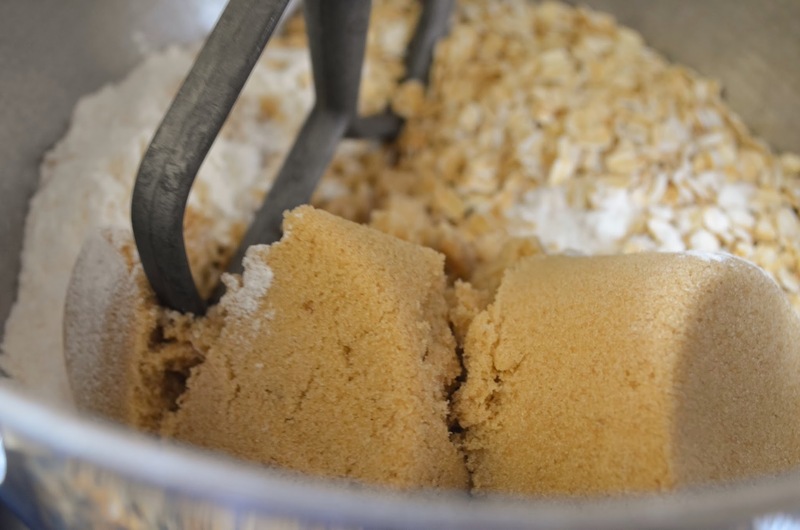 For Oatmeal Crumb Crust: To a mixing bowl add oatmeal, flour, brown sugar, baking soda and salt. Add softened butter cut into tablespoon sized pieces and mix on medium-low speed until crumbly. Butter and line a 9"x13" pan with parchment and butter parchment. Add half of the oatmeal crumb crust to the lined pan. Press mixture firmly down and bake in a 350 degree oven for 12 minutes. Sprinkle chocolate chips and nuts (I didn't add nuts on this occasion since there were multiple couples and some people don't like nuts) evenly across crust and cover with caramel sauce. Sprinkle remaining half of oatmeal crust evenly over the top of caramel and bake for 20-22 minutes or until golden brown. Allow to cool 2 hours before cutting. Oatmeal Chocolate Caramel Carmelitas with homemade caramel recipe from Serena Bakes Simply From Scratch. Heat cream, butter and sea salt in a small sauce pan over medium heat until butter is melted. Set aside. In a large sauce pan combine sugar, corn syrup and water. Cook over medium-high heat until caramel becomes a medium brown color. Do Not Stir Caramel, swirl the pan if needed. Continue to stir caramel for 3 more minutes. Remove from heat stir in vanilla and set aside. Preheat oven to 350 degrees. Butter a 9" x 13" baking dish and line with parchment paper and butter parchment paper. In a large mixing bowl add flour, oatmeal, brown sugar, baking soda and salt. Mix on low speed until combined. Cut butter into tablespoon sized pieces and add to the oatmeal crumb crust mixture, mixing on medium speed until combined and crumbly. Pour half the oatmeal crumb crust mixture into parchment lined pan and press mixture firmly down. 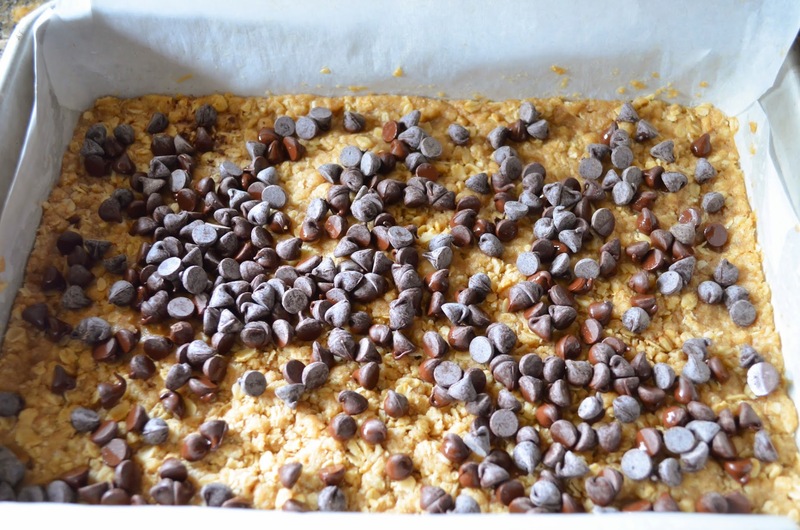 Remove from oven and sprinkle with chocolate chips and nuts. Pour caramel sauce evenly over the top. Sprinkle remain oatmeal crumb mixture evenly over the top and bake an additional 20-22 minutes until lightly brown. Cool Oatmeal Chocolate Caramel Carmelita's for 2 hours before cutting. 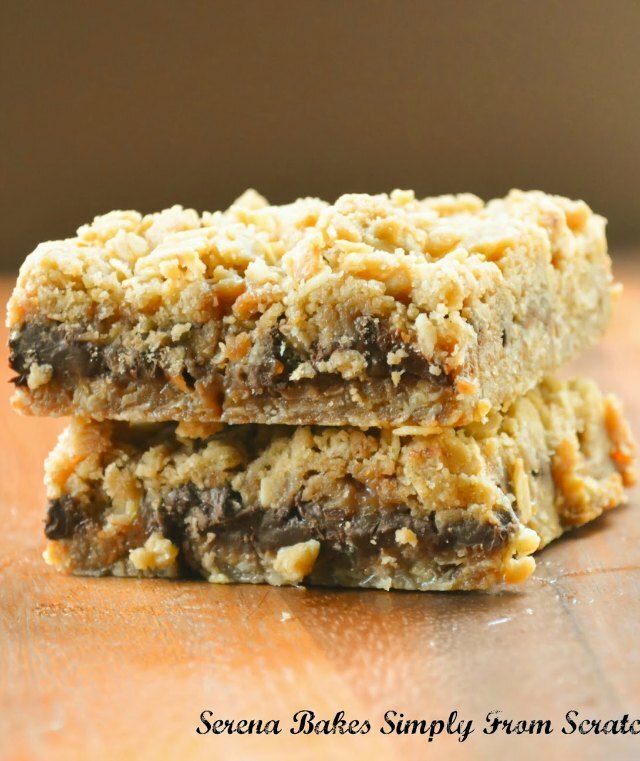 Delicious oatmeal chooclate bars looks yumm. Wish I can get a taste test. I love carmelitas! I have nver made the caramel from scratch for them though. Pinning to try! Yum! I can see why these are popular. You can't go wrong with caramel and chocolate...especially when combined in a chewy bar! Thank you for sharing! I want to make this! Hope you are doing better! I've made your recipe about 6 times now. Delicious! I always think I'll have enough for everyone to get as much as they want, but I think that would be an entire pan per person! My caramel turned out the best it's ever been today. I've also used your crumble from this for a peach crumble. Instead of caramel and chocolate, I just add fresh peaches, then top it all with whipped cream or mascarpone cheese. So good! Thank you for sharing!